Amazingly, this app began in 2006 and publicly released in 2008. The developer, Sandro Paganotti, is an open source proponent of the Rails 3.0 framework and blogs at RailsOnWave.com. The basic service at WhoDo.es is free (1 project at a time, 5mb storage) with further price plans based on your usage and ranging to $48.00/month for the 100 projects, 10gb storage plan. With such a long development history, you’d expect WhoDoes to have a strong background and robust working environment. You’d be right. The app is well-used, tested, and has a lot of features most collaborative project management and development teams will find useful. When you first log in, you’re greeted with your Workspace, a simple summary of what your project’s tasks are, what is due today and in the near future, tasks you’re currently assigned and tasks that haven’t been assigned to anyone. A calendar at right highlights days in the future with task requirements as well, so you can click there to see what’s coming up. Milestones, tasks, and team management are basically what you see in most PM apps like this, though WhoDoes allows you to send invites to team members and manage their tasks on a simple screen without a lot of clutter. The invite tool is especially nice, since it gives you an easy way to call in team members and them an easier way to quickly get going with the app on their end. You can assign others as managers as well, saving you from being the only dog in town with all of the PM tasks. Document sharing and other features are also well done and easy to use. This is one of the better PM apps I’ve reviewed in a while. It’s quiet buildup on the Web has really paid off with the energy many startups spend on hype being spent instead, it appears, on development. That seems to have paid off. 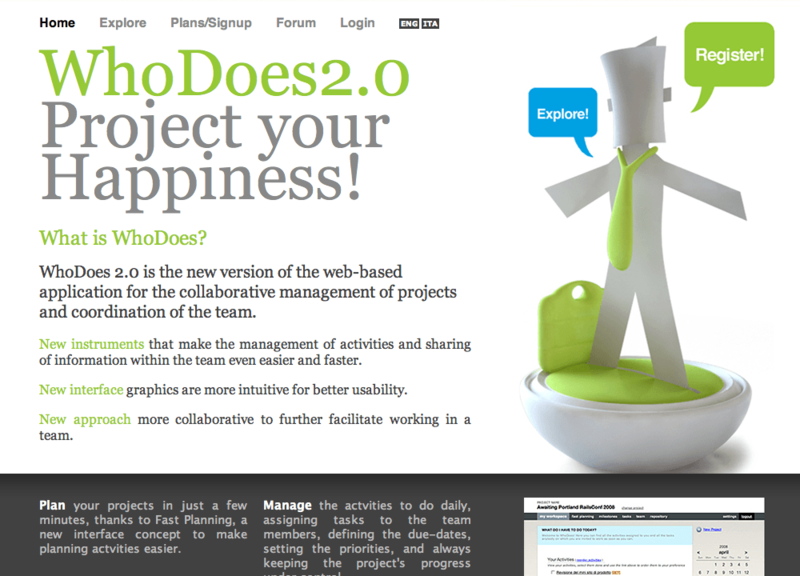 WhoDo.es is based in Italy and developed by Sandro Pagnotti and GotThingsDone.